Bing is best known as an Internet search engine to many of today’s kids and young adults. Should they search for Bing Crosby, they’d discover what baby boomers already know. The guy was a giant during the ‘30s, 40s and ’50s. He still has more No. 1 records -- 41 -- than anyone ever, including The Beatles or Elvis. He also had a smash hit radio show, won a best actor Oscar and teamed with Bob Hope for a series of seven “Road” pictures that dominated box offices. It’s all brought home in Bing Crosby Rediscovered, which premiered nationally on Dec. 2nd but is airing in Dallas for the first time on Friday, Dec. 12th at 7:30 p.m. on KERA13. Narrated by actor Stanley Tucci, the 90-minute American Masters presentation also will be repeated on Dec. 26th -- both locally and nationally. Crosby, who died on Oct. 14, 1977 at age 73 after a round of golf in Spain, has a re-coming out party every holiday season, when his White Christmas is heard throughout the land. The best--selling single of all-time originated in the 1942 film Holiday Inn before getting its own showcase in 1954’s White Christmas starring Crosby, Danny Kaye, Rosemary Clooney and Vera Ellen. Crosby’s last TV Christmas special, which aired shortly after his death, also became renowned for the odd couple “Little Drummer Boy/Peace on Earth” duet with David Bowie. It currently has more than 5 million views on youtube. 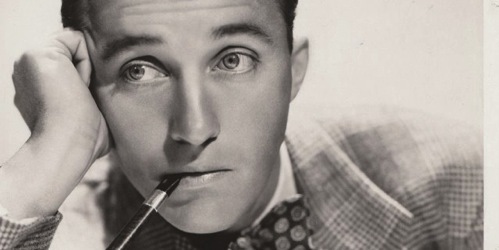 “He became the Christmas man,” says author Gary Giddins, whose 2001 biography, Bing Crosby: A Pocketful of Dreams, details the many other accomplishments of an older generation’s foremost crooner and matinee idol. “Every woman in the world wanted to marry Bing Crosby, whether they were married already or not,” his second wife, Kathryn Grayson, recalls in the opening minutes of the PBS film. He played a priest in two hugely successful films, Going My Way and The Bells of St. Mary’s. But Crosby was no saint. At the height of his fame he played hard, drank hard and, by his own admission, pretty much made a mess of his first marriage to Dixie Lee, who died in 1942 of cancer. They had four sons, Gary, Lindsay and twins Phillip and Dennis. Two of them -- Lindsay and Dennis -- committed suicide. And Gary wrote a tell-all book, Going My Own Way, that depicted his father as a cold, cruel, distant disciplinarian who repeatedly spanked him with a metal-studded belt until blood was drawn. “I’m not gonna have you grow into a fat, unattractive slob,” Crosby said in a letter to Gary. But Mary also is a staunch defender of her father, recalling a lunch she had with Gary in which he supposedly told her that his book wasn’t entirely factual and was trumped up in the interest of selling more copies. Crosby otherwise is portrayed as a generous, self-deprecating star who stood by artists such as Rosemary Clooney and Judy Garland during some of their darkest hours. He also befriended and showcased Louis Armstrong and Ella Fitzgerald in times when many in Hollywood weren’t nearly as willing to embrace black performers. Through it all, Crosby cultivated a neighborly, relaxed persona that made him seem like a next door neighbor who just happened to make hit records and movies. And his second marriage clicked, with Mary and sons Harry and Nathaniel all still speaking glowingly of a father who learned to accept and welcome their advances. Bing Crosby Rediscovered is a full-bodied, even-handed look at an entertainer who reigned supreme during a long bygone era that largely pre-dated television, rock music and even 33-and-a-third LPs. For the growing legions who say “Bing Who?”, this is the what, when, where and how.